Of course, not everyone who lived in the big cities had to work for a living. 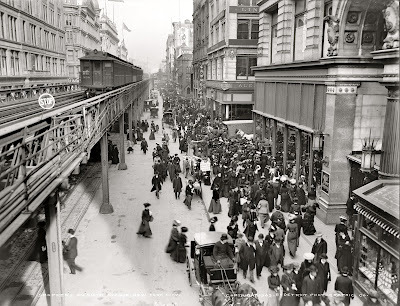 For those who could afford to spend more time and money on their midday meal, there were many fine restaurants that served lunch at a more leisurely pace. 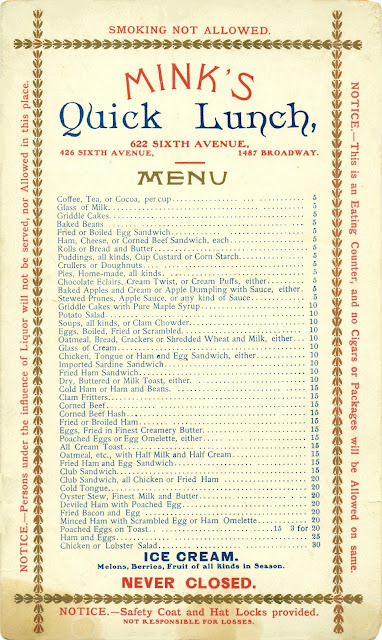 Two menus from New York in 1903 document the lunchtime experience at both ends of the social spectrum, shedding light on the class barriers that then existed. Mink’s was typical of the many restaurants serving a quick lunch. Open twenty-four hours a day, it operated at three locations along a 17-block stretch in midtown Manhattan near Times Square. 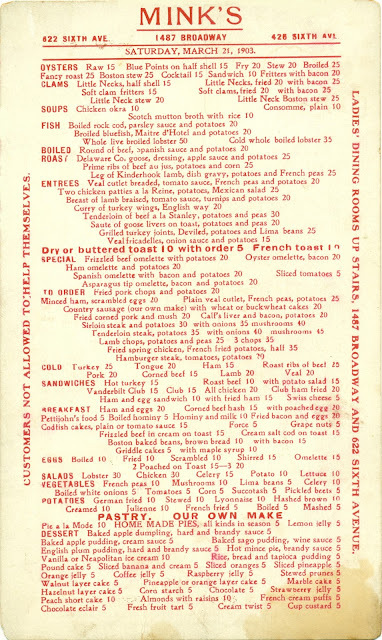 The speed of service did not deter Mink’s from offering a wide selection of dishes, as shown on both sides of this menu card. Such places attracted all kinds of people, as indicated by the instructions and warnings, including one that bluntly tells the customers not to help themselves to the food displayed on the counter. Although the admonitions on this menu are directed toward the customers, the tough waiters who worked at these places were not above reproach. For example, the, New York Times reported that two fights broke out at one location of Mink’s on July 18 of that year. Interestingly, each fracas erupted after someone complained about being overcharged. In the first incident, an irate customer pulled out a revolver and supposedly threatened to shoot one of the waiters, causing everyone in the restaurant to dive for cover. After being hauled off to the police station, the man told the officers that he had been treated roughly by the waiters. Thirty minutes later, the police were called back to the same restaurant, where they witnessed six waiters beating an African-American who had also complained about being over-charged. Now realizing that there was possibly another side to the problem, the patrolmen arrested the badly-battered customer and one of the waiters, hoping that this Solomon-like approach would bring an end to the violence. 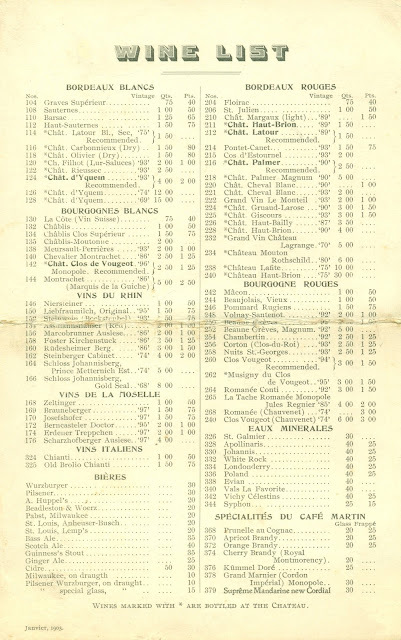 Unlike today, when there is a big price difference between the most expensive restaurants and those at the middle and bottom of the range, the prices on these menus from 1903 are not very far apart. In fact, the prices at the Café Martin are only about two to three times higher; the cost of three lamb chops at Mink’s was thirty-five cents, compared to seventy-five cents at the Café Martin. 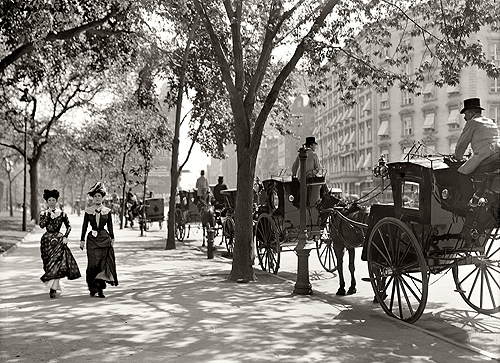 in fin-de-siècle America, there were barriers other than money that separated the classes, such as dress code, social customs, and the ability to read the French on the menu, not to mention having enough time to enjoy a long, luxurious lunch. 1. When menus were saved as mementos, they were often folded so that they could be slipped into a pocket, leaving a characteristic crease in the middle, as shown on this menu from the Café Martin. 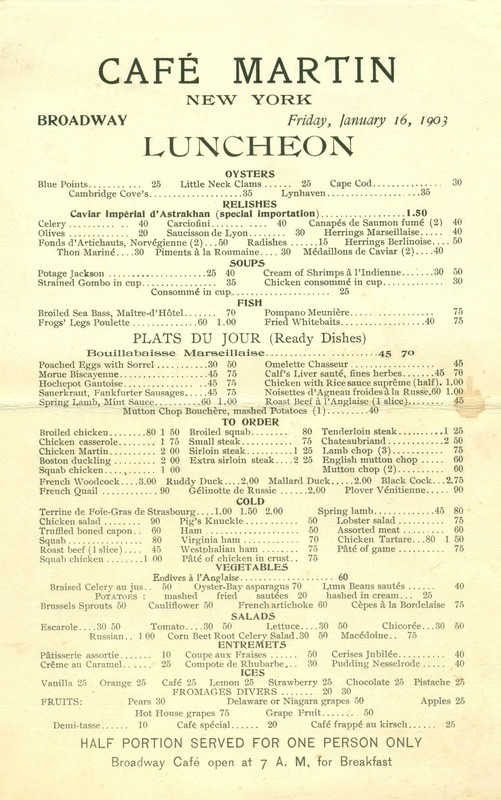 By contrast, menus from the quick lunches were seldom saved as souvenirs, making them relatively scarce today. The survival of this 6½ x 10¾ in. menu from Mink’s was made all the more improbable because it was printed on stiff, cardboard-like paper that was too thick to be folded without cracking. Mink's is a really great menu. That kind is rare indeed. These are interesting menus and they attest to the culinary spectrum that was New York. Whether they were Scalopax Minor donned with French titles, or the true European woodcock properly hung, makes little difference. Indeed, a French connoisseur found little to criticize in the 'fast food' of those days. If it were only the same. Interesting article....came across it in a search for menus for a history article I am researching and writing. Just a mention, my great uncle(along with his brothers and cousin) owned a lunch restaurant in New York City. It was called, 'The Richmond Co. Lunch Company', located at the foot of Whitehall St., directly across from the terminal for the Staten Island Ferry. Not sure if they had menus but if you ever come across one for said restaurant I would be very interested. Very nice article, enjoyed it and I have found some menu ideas for my article.